Michael Birmingham spoke of his pride after Horndean beat Hellenic League hosts Ascot United 3-0 in the FA Cup on Saturday. A storming second-half performance saw Benny Read, Zac Glasspool and Harry Jackson strike to send the Deans through. And Birmingham could not have been happier after a bruising day out. The Horndean boss said: ‘Ascot tried to bully and intimidate us throughout the 90 minutes and we were given no protection by the officials. ‘The pitch wasn’t the greatest either. There was no grass on it and it was rutted, bobbly and lively. ‘We had to adapt our game to suit the conditions and we did it well. 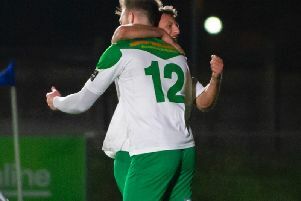 There was no fairytale triumph for Baffins Milton Rovers, who lost 4-1 to Hartley Wintney in their first home FA Cup tie. Tommy Leigh slotted the ball through the keeper's legs to give the Wessex League hosts the lead on the half-hour. The Southern League visitors netted a superb leveller on the stroke of half-time, though. And after the break Baffins conceded two penalties as Hartley Wintney eased through. Steve Leigh felt the final score flattered the visitors. ‘In some ways we beat ourselves by giving away two bad penalties,’ said the Baffins boss. ‘Hartley Wintney felt we were the best team they had played so far which is a massive compliment. ‘They were a well-organised side who proved much sharper and physically stronger than us. ‘I couldn’t fault the effort of our players but feel we could have played better. ‘It was still a great day for the club. We had around 300 turn up to support us which was great. United Services exited the competition in a 3-1 home defeat against Sholing on Friday night. Meanwhile in the Wessex League premier division, AFC Portchester and Fareham Town fought out a 0-0 draw at the Crest Finance Stadium.